Are you sitting comfortably? Welcome to my workplace series of podcasts that will help you to navigate those inevitable difficult events at work that are part of being a small business owner, manager and Leader. Today I want to talk about how to deal with workplace conflict. Employees are a huge resource in a small business and no doubt you’ll have invested a lot of time and effort in to training your employees and forming a good relationship with them. But what about when they don’t have good relationships with each other? Difficult relationships at work can affect productivity and morale because employees who are embroiled in conflict aren’t happy employees. It can be difficult to deal with workplace conflict and some degree of conflict between your employees is inevitable, but it should never be ignored. What might seem like a petty disagreement to you can soon turn into bullying or chronic antagonism which can affect your business. That’s why it’s your job as a small business owner to recognise where there is conflict and address it quickly. So what are the main causes of workplace conflict? The first cause, as in many conflicts in life, is poor communication. Oh, how much simpler life would be if we just talked openly and honestly to each other! For example, if one employee has a regular task assigned to them and you give it to someone else without explanation, this can cause problems. The employee might feel that you think they aren’t capable or that you favour the other employee over them. They might tell other employees and then it becomes unhelpful gossip and causes animosity between employees. A simple explanation from you would avoid all of that. Personality differences are another big cause of conflict. Every one of your employees has lived a different life and they’ve had different experiences which has shaped who they are today. It’s when employees don’t understand or accept personality differences that conflicts arise. Maybe you have one employee who has a reputation for being a straight talker who ‘shoots from the hip,’ and maybe you value this quality. But another employee might have a more reserved personality and actually find this person to be quite rude. Clashes will inevitably occur. Conflicts can also arise when employees have different values. Maybe you have an employee who is older and experienced, and who has a strong work ethic, who comes into conflict with a younger employee who they perceive to be ‘lazy’ or who calls in sick once too often on a Monday morning after a weekend of socialising. Even in this situation, it’s not necessarily the differences that cause the conflict, it’s the failure on the part of the employees to accept each other’s differences. Finally, competition between employees is another common cause of conflict. Sometimes, competition can be a motivator to do well, but if it’s not managed, an employee’s ego can take over and employees can end up sabotaging each other or being hostile which doesn’t make for a healthy working environment. How, then, can you resolve conflict as a small business owner, when you don’t have a huge HR department to sort out issues for you as a larger organisation would? The first step is to meet with the conflicting employees to let them have their say about exactly what has been going on. Ask them to be respectful in the meeting and not to interrupt or speak over each other. this will help you get to the root of the problem. For example, if it’s a personality conflict, what differences are at play exactly, and is there anything you can do to either separate the employees or find other ways to accommodate their needs? The next step is to try and find some common ground. No matter how bad a conflict is, there’s almost always something you can get people to agree on. This is a good basis on which to start solving the problem. So how are you going to solve the problem? Are you going to negotiate, compromise, or do more to accommodate the employees in question? As a small business owner, you need to balance encouraging employees to come up with solutions and encouraging them to come up with a resolution that suits everyone. You might find that you need to impose a solution sometimes, but the ideal outcome is finding a solution that everyone can agree on. You can’t always solve every conflict, especially if it boils down to a clash of personalities. It can be helpful to remind employees that they don’t have to like each other, but they do have to work together for the business and for you, so they should act professionally. 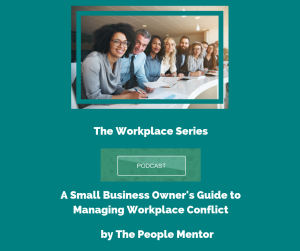 Conflict can’t be avoided, but it can always be managed, and conflict that is ignored is bad for business, and it’s bad for you and your employees. And lastly, conflict is sometimes a fact of life. Differences of opinion can be healthy and can actually lead to business growth; we just need to learn how to accept differences rather than reject them.